Daniel Schorno and I performed Kairos Cumulus Nimbus, a new iteration of our "Kairos" duo project at the International Computer Music Conference in Utrecht, Netherlands on September, 14, 2016. Here's a snippet from our last performance, in Odessa, Ukraine. I have received a grant from the Greenville Metropolitan Arts Council to help fund this trip. I recorded John Psathas's Piano Quintet, arranged for piano and percussion by Omar Carmenates, in May, 2016. This is part of Omar's Psathas Percussion Project, and will be released within a few months. In the meantime, here's a sneak peak from the recording session. I was a guest performer at the 50th Anniversary National Conference of the Society of Composers, Inc (SCI), November, 2015 in Gainesville, FL. Here's a video of one of my performances (Liviu Marinescu's Shadows for piano and electronics). duo runedako premiered new works by Francois Rose and Harvey Sollberger in 2015. In March, 2013 I appeared as guest artist for a Disklavier Festival at University of Wisconsin, Madison. duo runedako has commissioned Harvey Sollberger to compose a new piece for piano four-hands. This project is being supported by grants from the Greenville Metropolitan Arts Council and Furman University's Research and Professional Growth committee. 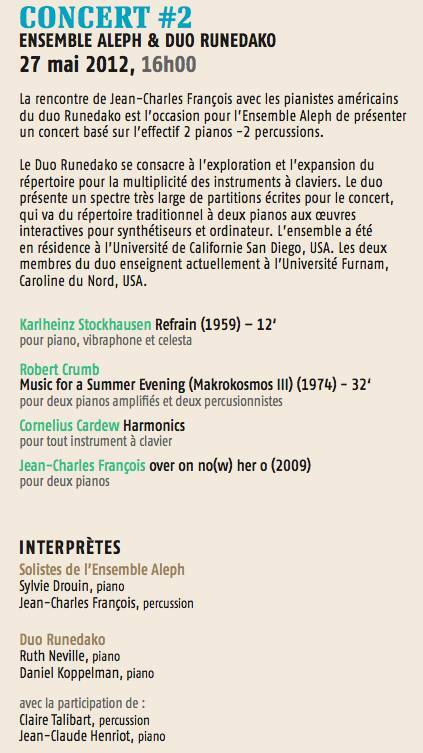 duo runedako performed with the Aleph Ensemble in Paris in May, 2012. I have begun collaboration on a project involving improvisation together with gesture characterization software by Christopher Dobrian. The software provides a virtual improvising partner, realized on the Yamaha Disklavier. Gapplegate Classical-Modern Music Review: "sensitive and dynamically brilliant execution"
CultureCatch, Best New Classical Albums of 2011: "shadows and flickerings of light dance about, intertwining in striking juxtapositions"
NewMusicBox: "exploding...with an assured sense of ensemble"
Textura: "a deft balance between experimentation and listenability"
My newest CD has been released on the Innova label. "Recombinant Nocturnes" features music for piano and electronics by Benjamin Broening. It is also available via iTunes and Amazon. 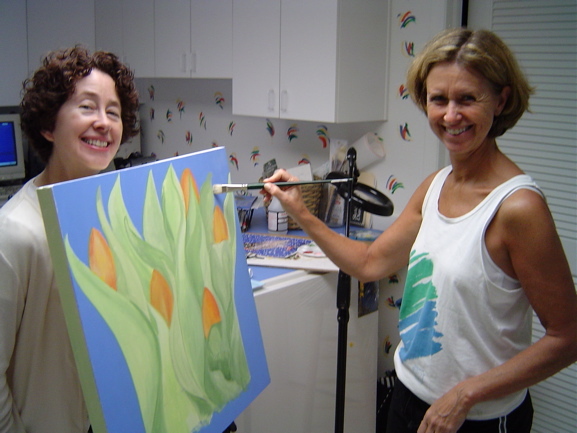 In July, 2011, I was a guest artist at East Tennessee State University in Johnson City, TN. I gave a lecture on "new technological resources for live performance", and performed a solo recital. In May, 2011, I received the Alester G. Furman, Jr. and Janie Earle Furman Award for Meritorious Teaching. The award is made "on the basis of professional competence, enthusiasm for classroom teaching, the ability to inspire students with a love for learning, and concern for and interest in their personal development." In April, 2011, I received the Orpheus Award ("for advancing the cause of music") from the Gamma Eta Chapter of Phi Mu Alpha Sinfonia. I have commissioned a new solo piano work from composer Eric Moe. The commission will be funded by a grant from Furman University's Research and Professional Growth committee, plus a matching award from the Greenville Metropolitan Arts Council. Update: the piece, entitled "Hot Keys", has been finished, and I will be premiering it soon. Recording sessions for Benjamin Broening's "Nocturnes" CD took place at the University of Richmond from May 22-25, 2010. The disc will include works for solo piano, piano plus electronics, piano four-hands, and two pianos. duo runedako is featured on the pieces for two performers. Update: the disc has been accepted for publication by Innova Records. Benjamin Broening and I received an ACS Faculty Renewal Grant to undertake a project entitled "Nocturnes: Composing, Performing and Recording with Technology." I received an extension to my Fulbright award, and headed back to Odessa in 2009 as Artist-in-Residence with the Association New Music. I did solo and duo performances across Ukraine, and in Krakow, Poland. Escapement has been released by Everglade in a new multi-channel format. It is also available at Amazon. In April and May, 2008, duo runedako performed six times in various venues in Odessa, Kyiv, and Simferopol, Ukraine. 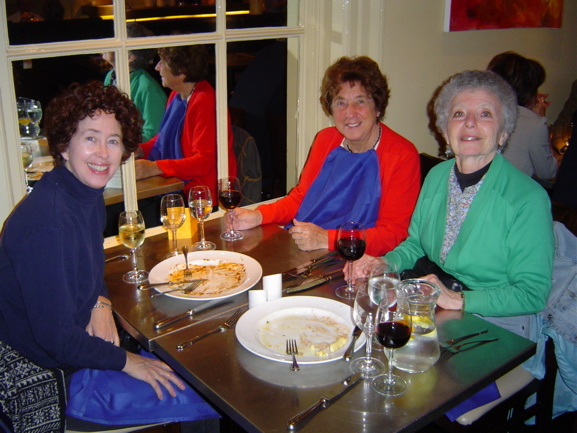 For more information about my Fulbright activities, see our Fulbright blog. In September, 2008, I recorded Christopher Dobrian's Cycles Interrupted, together with soprano Tamara Matthews and saxophonist Matt Olson, for a future Dobrian release. In November, 2008, duo runedako made its third appearance on the Gluck Chamber Music Series in La Jolla, CA (previous appearances were in 1995 and 2003). The duo runedako recording of David Gillingham's Interplay (for piano four-hands and orchestra), made in 1996 with the Prague Radio Symphony Orchestra, has finally been released by MMC recordings on a CD entitled "Perspectives." I have been awarded a Fulbright grant to Odessa, Ukraine for February - June, 2008. 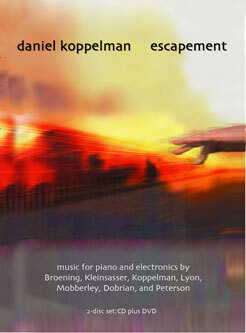 Everglade Records has accepted Escapement for publication, in an updated and revised edition. This release will feature new 5.1 mixes of the repertoire. duo runedako performed at the North Charleston Arts Festival in North Charleston, SC in May, 2007. I performed at the Sonorities Festival in Belfast in April, 2007.
duo runedako performed at the Florida Electroacoustic Music Festival in Gainesville, FL in April, 2007.
duo runedako performed at the Temple of Israel in Greenville, SC in January, 2007.
duo runedako performed with the Greenville Symphony Chamber Players in November, 2006.
duo runedako performed at UC San Diego in La Jolla, CA in November, 2006.
duo runedako performed at the International Computer Music Conference in New Orleans, LA in November, 2006.
duo runedako performed at the Furman University faculty showcase in Greenville, SC in October, 2006. Musical Expression with New Computer Interfaces" -- at the NIME Conference (New Interfaces for Musical Expression) in Paris on June 7, 2006. LiSaFest06@Furman took place at Furman University from May 15-19, 2006; for the concert on May 19 I was assisted by Tamara Matthews, Matt Olson, Ruth Neville, and Daniel Schorno, performing works of Christopher Dobrian, Mark Applebaum, Benjamin Broening, William Kleinsasser, Daniel Schorno, and Daniel Koppelman. duo runedako performed at the festival "Two Days and Two Nights of New Music" in Odessa, Ukraine, on April 21, 2006. I gave a presentation at a conference on electroacoustic music sponsored by NITLE in Chicago on March 10, 2006.
duo runedako performed on the "Music at the Forefront" series at Bowling Green State University on February 27, 2006.
duo runedako gave a recital at Furman University on February 2, 2006. The second Live Sampling commission has been completed: William Kleinsasser's Protean Profile, for two pianos, computer, and interactive sampling instrument. The composition is a "second path through the musical design of the piece Innocent Proteins", a concerto for two pianos and chamber orchestra, which duo runedako premiered in March, 2005. "Escapement" (my new CD/DVD) received a nice review in the December, 2005 issue of Keyboard Magazine, where I was named the "Unsigned Artist of the Month." The first commission for my Live Sampling project has been completed: Mark Applebaum's on the nature of the modern age, for piano duo and electronics. 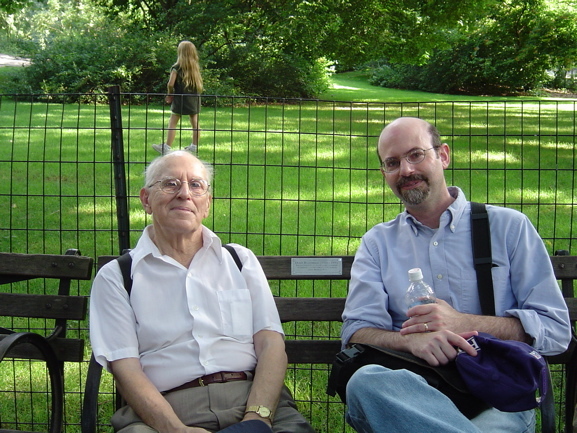 The work was written "in loving memory of John Silber, compassionate mentor and intrepid experimentalist." duo runedako will premiere it in February, 2006. "Escapement" is finished! My 2-disc set (CD plus DVD) of music for piano and electronics is now available from Horizon Records. Below is a shot of the front cover of the box. For more information on Escapement, click here. duo runedako will perform on the "Music at the Forefront" series at Bowling Green State University in February, 2006. Things are shaping up for my Live Sampling project in 2006. I have commissioned pieces from Christopher Dobrian, Benjamin Broening, William Kleinsasser, and Mark Applebaum. I am also composing some music for duo runedako and for my trio with Tamara Matthews and Matt Olson. Daniel Schorno of STEIM in Amsterdam will be in residence at Furman for a week in Spring, 2006 to help prepare the commissioned pieces; he will also give performances and master classes. I performed William Kleinsasser's Quintuple Escapement in April, 2005 at the SEAMUS National Conference in Muncie, IN. This was my first performance with my new MOTU Traveler interface -- a nice addition to my arsenal. As a warm-up for SEAMUS, I played Quintuple Escapement on March 30 at the annual "Modern Music" concert presented by the Phi Mu Alpha brothers at Furman. In March, 2005 in Baltimore, duo runedako premiered William Kleinsasser's Innocent Proteins, a chamber concerto for two pianos and ensemble. The duo performed in March on the Furman Faculty Chamber Music series at Gunter Theatre in Greenville, and in February on the "Winter Classics" series at Christ Church, also in Greenville. In January, 2005 I received funding from the Andrew W. Mellon Foundation for a Career Enhancement grant to explore live sampling together with Furman colleagues Tamara Matthews and Matt Olson. The project will take place in 2005 and 2006. There is an article about this project in the Associated Colleges of the South newsletter. My students in Music 45 (Project in Music Technology) presented a concert of music for live performer plus technological resources on February 10 on the Furman campus. 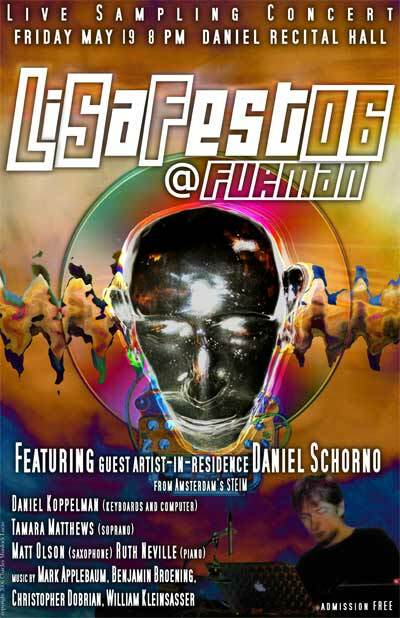 I performed my composition "Solecism" at a CLP event entitled "Music as a Mirror" at Furman on January 6.
played a solo recital and gave a lecture/demo. Third Practice Electroacoustic Music Festival in Richmond. involving soprano Tamara Matthews and Matt Olson. William Kleinsasser, Quintuple Escapement, for MIDI controller and computer. Paul Rudy, Church Keys, for piano and tape. James Mobberley, Voices: In Memoriam, for piano and computer. Composed Solecism, using LiSa and my new Novation ReMote 25 controller. (Oliver North, Anita Hill & Clarence Thomas, John Dean, etc.). Gave a 'mostly solo' recital as part of Furman's Summer Keyboard Institute. Worked with composers on getting recent repertoire transferred to OS X versions. worked on DVD authoring of "Escapement" project (see above). London, England (with Ruth and our two moms).